What a flippin week, just a quick post to say I am alive, though I have had a trip to hospital! I've been ill, basically on Monday I got a virus what happened next was the horrid bit, would you believe you can be allergic to your own virus. I'm afraid I came down with a rare allergic reaction to my own virus called angiodema and my nose and the surrounding tissues increased to twice their size, this then lead to me getting a cellulitus infection in my leg and it's all be a little scary, luckily after the doctor had me admitted to the emergency assessment ward they gave me 4 different types of tablets (I had to take 15 tablets this morning!!!!) and I'm on the mend, still feeling a bit yacky but my facial swelling is going down and the cellulitus is under control though my leg is a tad sore. So that was my week, mostly spent in bed I have to say and resulting in Paul having to take unpaid leave to look after the children, I don't fancy next weeks wage much, top tip, don't go and work for Royal Mail if you want them to be understanding in a crisis!! 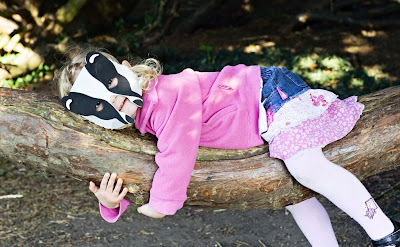 Oh the photo was a badger I found in a tree when we went up to Wallington Hall for a theraputic afternoon tea this afternoon!! Aww, you poor thing, I'm glad you're on the mend now. I do still read as often as I can you know :) just haven't been commenting, but I will in future. I hope you feel better soon Mandy. Just catching up on blogs - sorry I've missed your news lately. hope you're feeling better about everything today.